The internet has always been rife with ‘optical illusions’. Most of which just give me a headache or make me go cross-eyed, to be honest. But this one is doing the rounds, and it’s a good. Ish. This is the internet, there is definitely easier ways to look at attractive women, surely? This is a pretty creepy negative image of a woman. 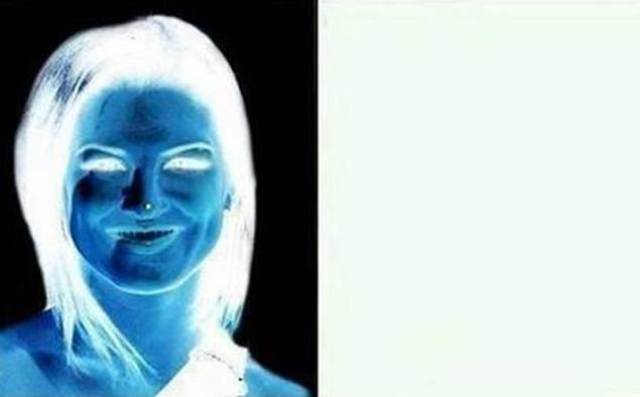 Stare at her nose for a bit, and then look at the blank space next to her. If you’ve been staring long enough, and your eyes work properly, and attractive brunette woman will appear. No in your room, just temporarily in your vision. Which is a shame. It’s a negative afterimage, and is due to the eye cells that send colour to the brain. Staring at a colour group for too long (blue and white in this) the cells get tired, so when you look away, the coding cells get stronger for the opposite colours (yellow, in this case).